T. Rowe Price Group, Inc. (NASDAQ:TROW) reported earnings on April 24. Here are the numbers you need to know. For the quarter ended March 31 (Q1), T. Rowe Price Group, Inc. (NASDAQ:TROW) met expectations on revenues and beat slightly on earnings per share. T. Rowe Price Group, Inc. (NASDAQ:TROW) recorded revenue of $815.7 million. The 14 analysts polled by S&P Capital IQ anticipated a top line of $817.9 million on the same basis. GAAP reported sales were 12% higher than the prior-year quarter’s $728.7 million. EPS came in at $0.91. The 22 earnings estimates compiled by S&P Capital IQ predicted $0.89 per share. 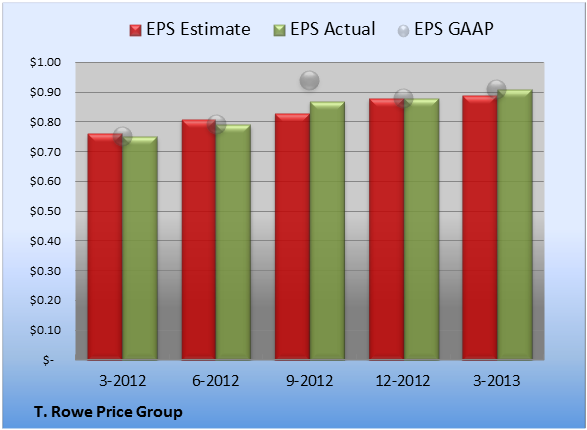 GAAP EPS of $0.91 for Q1 were 21% higher than the prior-year quarter’s $0.75 per share. Next quarter’s average estimate for revenue is $857.7 million. On the bottom line, the average EPS estimate is $0.96. Next year’s average estimate for revenue is $3.47 billion. The average EPS estimate is $3.88. The stock has a three-star rating (out of five) at Motley Fool CAPS, with 376 members out of 405 rating the stock outperform, and 29 members rating it underperform. Among 124 CAPS All-Star picks (recommendations by the highest-ranked CAPS members), 119 give T. Rowe Price Group, Inc. (NASDAQ:TROW) a green thumbs-up, and five give it a red thumbs-down. Of Wall Street recommendations tracked by S&P Capital IQ, the average opinion on T. Rowe Price Group, Inc. (NASDAQ:TROW) is outperform, with an average price target of $72.10. 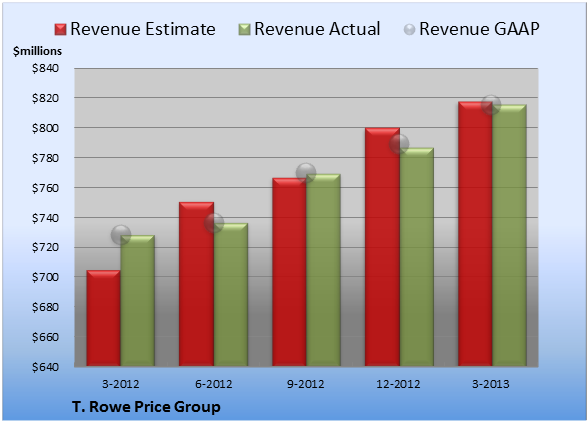 The article T. Rowe Price Group Beats Analyst Estimates on EPS originally appeared on Fool.com and is written by Seth Jayson.